100 not out! Hunnarbaaz, India's only Skill based show hits the milestone of 100 episodes! You are at:Home»News»Events»100 not out! 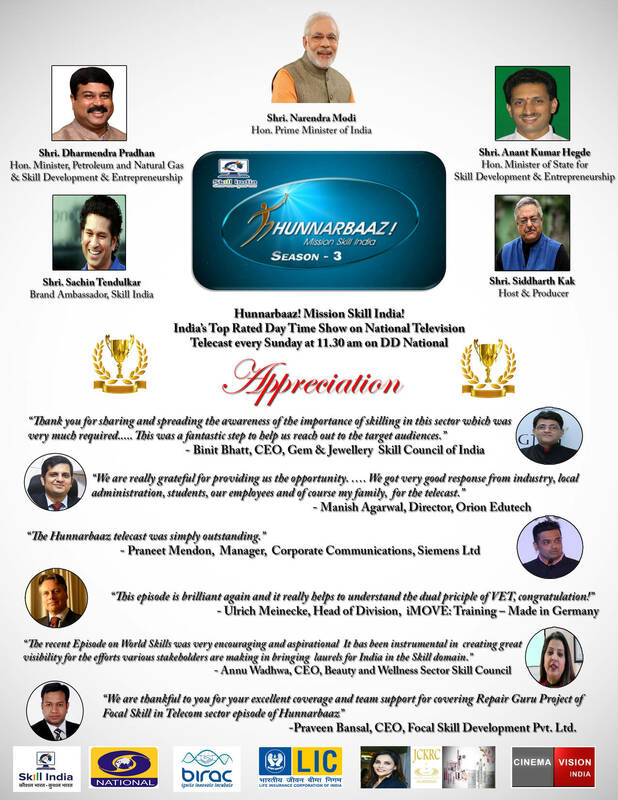 Hunnarbaaz, India’s only Skill based show hits the milestone of 100 episodes! 100 not out! Hunnarbaaz, India’s only Skill based show hits the milestone of 100 episodes! It was a journey which began in 2014, with a vision to bring to audiences India’s first ever television show on National Television which would highlight skills and career opportunities and feature real life success stories, inspiring celebrity and iconic participation and challenging competitions to create awareness about skills and entrepreneurship in India. A show that would spread awareness about the opportunities available to the youth even if they have not had the benefit of higher education but if they are keen to acquire a skill that would make them job-ready. And today, as Hunnarbaaz! Mission Skill India, powered by Skill India Mission, celebrates the achievement of having hit a century in its fourth season, it has become a top rated day time show on Doordarshan as well as an innovation partner of the National Skill Development Corporation (NSDC). The show is produced by Cinema Vision India, which has to it’s credit the hugely successful series Surabhi, which ran for 10 years on DD. He further adds, “ thanks to the National Skill Development Corporation and the Ministry of Skill Development & Enterpreneurship, one has come to realise and understand the power of skills. The Skill India Mission aims to transform lives which appear hopeless, to offer a ray of hope to the underprivileged and to the marginalised to live with dignity and self respect and in particular, to eliminate the tyranny of education in estimating one’s self worth. In this journey Hunnarbaaz has showcased not only some amazing stories of achievement across different skills, entrepreneurship, but also many schemes and opportunities for young people available in the skilling ecosystem for changing their lives in simple steps which take not years but weeks. For us the 100th episode is an indication that we are perhaps on the right track and that there is a need for such programmes to bring the government, industry and the people together in a massive public -private partnership. Over the last four years, the show has put the spotlight on various institutes which are providing job-oriented training to the youth, improving the skilling ecosystem of India. While the training efforts of Corporate giants like Larsen & Toubro, Maruti Suzuki, Volkswagen, Tata Motors, Tata Strive, Welspun, Siemens, GE, SBI Card and Vivo Healthcare have been featured on the show, the PSU’s such as Hindustan Petroleum Corporation, Hindustan Copper Limited, Indian Oil Corporation have also been covered extensively. Most rewarding though are the stories of the youth themselves who have refused to let poverty and their backgrounds hold them back, taken the initiative to undertake skill training, find employment and a better standard of living. Constant support and guidance from the various Skill Sector Councils have helped in covering the many different sectors where training is available extensively. The team has also travelled to Russia, Switzerland and Germany to explore the skill ecosystems there and unearth what India could learn from them. As such, the 360 approach to skill and skill training has remained the USP of the show, which is reflected in the appreciation and praise from various stakeholders. Click here to download the brochure. In the current Indian television scenario, where high drama reality shows and daily soaps jostle for TRPs, Hunnarbaaz is truly a show that stands out. And with continued support of the viewers will continue to do so! Many congratulations to the entire team of Hunnarbaaz and of course Ms. Shipra, Ms. Shweta and Mr. Siddharth Kak for their hard-work that had really paid off… Cheers to entire NSDC, MSDE and PAN India Sector Skills Councils….